Internationally, neo-Nazi Terror and racist violence have turned into a real threat for open societies and social minorities.Utøya, Charlottesville, Las Vegas, Munich: The political shift to the Right in the United States as well as in Eastern and Western Europe is accompanied by an increasingly organized wave of right-wing and racist violence. Networks of the extreme Right and “Lone Wolves” feel legitimized by the racist discourses in their respective societies to take up the “fight for White Supremacy” in an increasingly militant and violent manner. As the Network NSU-Watch and the Rosa Luxemburg Foundation have invited international experts from anti-fascist organizations and initiatives to Berlin for a Panel Discussion on November 10th we want to re-publish international articles that will provide an overview on the internationalist viewpoint and to discover differences and similarities of the respective formations of right-wing terrorism and their international networks. Even if we wanted to forget about the fascist threat for a moment, events in Charlottesville, Virginia in the United States, are an alarm for the danger of re-emerging extreme right across the world. A racist gathering, organized by neo-Nazi organizations, old and new, resulted in the murder of a 32-year-old anti-fascist, Heather Heyer, and the wounding of many other protesters who en mass expressed their opposition to the fascists. For us in Greece, these developments are of great importance for two reasons. On the one hand, because the neo-Nazi organizers at the Charlottesville Congregation openly state that their “inspiration” for their murderous activity is the action of Golden Dawn. On the other hand, the case of the murder of Pavlos Fyssas and the Golden Dawn trial is a battle that is still open. This is a confirmation of the assessment we have made in this magazine that the activity of the anti-fascist movement in Greece and the evolution of the Golden Dawn trial will have an international impact. This year’s mobilizations for the four years since the assassination of Pavlos Fyssas found us in a critical phase in the course of the trial: after a long process that began on 20 April 2015, but essentially in September of the same year (when the parents of Pavlos Fyssas ascended to the witness stand of the Athens Three member Court of Appeals), the witnesses of the prosecution are coming to an end. What will follow now will be the documents phase, where the court will get acquainted with all the rich investigative material (written, visual and audio) before passing on to the witnesses of the defendants and the defendants’ pleas. The anti-fascist movement does not determine its choices depending on the decision of any court. The characterization of the Golden Dawn as a “criminal organization” existed in the anti-fascist and left-wing material many years before the state launched a criminal prosecution against the leadership of the Nazi organization in September 2013. However, what emerges from the court hearing are crucial facts and weapons in the anti-fascist struggle. And if there is a lasting pattern in the testimony of the victims and the witnesses in the trial, this is the identification of the “legitimate political party” with the criminal action of the storm troops, with the Golden Dawn offices being the most important link acting as the base of murderous attacks. This will be the main subject of this article. From the attacks during this period, there are fortunately some irrevocable convictions that accurately describe the operation of the Golden Dawn raids: many and armed against a few and unarmed, the surprise of the victims, a short attack schedule with shared roles, coordinated retreat. The condemned for these attacks were the leaders of Golden Dawn (Kusumvris, Zafiropoulos, Siatounis, etc.) whom the leadership of the organization covered with mobilizations outside the Courts – although it typically denied any relationship. In such a trial at the court in Evelpidon in 1998, a Golden Dawn battalion squad, led by its deputy Periandros (Antonis Androutsopoulos), assaulted Kousouris and two other comrades, all members of the New Left Current (NAR). The characteristics of the assault were identical to the ones above, and for this attack there is Periandros’s irrevocable conviction for attempted homicide. A well-known argument back in May 2012 was that the Golden Dawn’s entry into the Parliament would probably tame its criminal action. The liberal / right version of the argument is that “legitimacy” ultimately undermines Nazism, from which derives the logic of giving it unhindered all the privileges of a “legitimate political party” (financial aid, television time, etc.). A part of the Left accepted the same conclusion through another route: “they will now put on a tie”, was the statement of Aleka Papariga, leader of the Communist Part of Greece (KKE) echoing the views of many left-wing militants. However, things did not go like this. Instead of a reduction of the number of crimes after Golden Dawn’s entry into the House, we had a national rise with the leadership core becoming more executive, and the storm troops making their appearance in every city of Greece. The mechanism of disseminating criminal activity was precisely the building of local organizations and the opening of offices. It was not outside the organization, but inherent in its existence and its action. According to the Regulations of the local organizations of Golden Dawn, which Christos Pappas, the atypical “Deputy Chief” has drafted, the position being “the one responsible of political action” organizing “Local Security”, is part of the Five-Member body that manages the local organization. This security is the basis of the storm troops, the militarized bodies of armed Golden Dawn members that spread terror in the street markets and neighborhoods in the day, while during the night they attacked immigrants and leftists. The command of the storm troops, the core of the criminal action, is identified with the leading core of the Golden Dawn. Due to the seizure of the hard drives of the leading members of the Nikea branch, we have the most extensive information about the storm troops of the Piraeus area. Witness testimony confirms and enriches the investigative material. According to the testimony of the municipal councillor of Nikea, Costas Papadopoulos, the operation of the Golden Dawn offices in Nikea 2011-2013 coincides with the increase in racist attacks in the region, which stop abruptly after the assassination of Fyssas and the initiation of criminal prosecution. The operation of the offices marks the Golden Dawn’s attempt to “conquer” Kokkinia, which is also expressed territorially, with a guard (“Security”) outside and around its offices. Security attacks took place on citizens, leftists, immigrants, both out of the office and on outings on foot and with vehicles in the surrounding area. It is deemed so successful that the central leadership of Golden Dawn sends it into actions all over Greece (the attacks on Maria Troulou and Savvas Mavridis in Paros, terror of the Roma in Skala, Lakonia, with Kasidiaris declaring that “all good jobs are done at night”, etc.). The men of Nikea Security are the ones who gathered the night of the assassination of Fyssas in the Golden Dawn office, equipped and armed, then they disembarked at their target in Keratsini, according to the accused George Dimou (see the testimony of the journalist Yannis Papadopoulos and the sister of Roupakias, Chrysoula). In June 2012, a few days before the second elections, Golden Dawn MP Lagos publicly announces the main areas of action for the local Perama organization, targeting the Egyptian fishermen and PAME trade unionists. The attack on the Egyptians on the evening of 12/6/2012 takes place a few hours later, warming up for the opening of Perama’s offices in December of the same year. Pantazis, leader of the branch and then a five-member executive member, is the man behind the opening of the offices and at the same time the head of the local battalion squad (he is accused of assaulting the fishermen, as well as of the ambush on PAME). After the warm-up practice on the heads of immigrants, the attack on Communist Party unionists of PAME on 12/9/2013 (a few days before Pavlos Fyssas’ assassination) is perfectly organized, in cooperation with the Salamina local, under the direct guidance of Lagos to the members of the Five Member Body Pantazis and Hatzidakis (statements by S. Poulikogiannis and the journalist Yannis Baskakis). It is no accident then that the next day the police found a club with a metallic end at the local offices at Perama the same as those used in the attack (testimonies of Goutis and Tiliacos). The offices of Golden Dawn in Piraeus constituted the base of operations of multiple criminal activities of the organization. Thereafter, the four Golden Dawn members who attacked the members of the Anti-Nazi Initiative in September 2012 (conviction of Salouphas and Apostolou) began. From there the motorcycle motorcade, which attacked the SYRIZA booth on the evening of the 17/6/2012 elections (lodged by the lawyer Yiannis Kardaras), began. It is no coincidence that inside the offices was found on the day after the assassination of Fyssas a collapsible club, even if Lagos had given orders to “empty the offices”. But an important function of the offices of Piraeus was the organized effort to extend Golden Dawn to the southern suburbs of Attica. Thus, according to the statements of Panagiotis Drimylis and the journalist Yannis Baskakis, the motorcycle motorcade that attacked the Free Social Space “Synergio” in Ilioupoli on 10/7/2013, was initially established at the offices of Piraeus with aid from the offices of Nikea. These people then met in the Alimos offices with the rest of the Golden Dawn members and, under the guidance of Lagos and Mihos, who were present (Lagos with his parliamentary car! ), drove to and assaulted the “Synergio”. The messages on Lagos’s cell phone leave no doubt about the completely organized and premeditated nature of the assault, which among other things aimed at opening offices of Golden Dawn in Ilioupoli. The offices of Anavyssos were the base for the attack on the unionist D. Zambelis, on 19/2/2013, from a battalion squad of ten people with a military-khaki attire, because he was listening in his car to music that was “disturbing” for the Golden Dawn. In Patras, on 7/7/2013, pupil Chr. Antiochos was attacked by three people on the street bellow the Golden Dawn’s office, with an ambush and insignia of the organization, who demanded his identity and then beat him. In Ierapetra, on 13/2/2013, the entire local Golden Dawn started from their offices and headed to the village of Vainia where they checked an olive mill for working foreigners and then invaded a Pakistani home and attacked them (Andreas Bilalis). In Veria, on 9/6/2012, a team of Golden Dawn (with the current MP Sahinidis) attacked anti-fascists, claiming to be on political outreach work: the real character of the attack was revealed to a court in Veria by the ex-member of Golden Dawn of Elias Stavrou, whose testimony is also imminent in the context of the big trial. In practice, the documents phase of the trial will be a slap for Golden Dawn. Videos such as the Mihaloliakos or Patelis (the infamous “Everything that Moves Gets Slaughtered”), where he describes the Nikaia battalion squad in the offices waiting for Lagos to give the “ok” for an attack, will confirm undoubtedly the testimony of the witnesses. An important role is still to be played by dozens of documents that were formed independently for the Golden Dawn’s action, some of them following the assassination of the Fyssas, some following police raids at the offices of the organization. In Thessaloniki, members of the Golden Dawn were arrested on patrol with knives under the offices of the organization. In Chalkida, weapons were found inside the offices, as well as in Messolongi along with helmets and police caps (depositing journalist Tsakanikas). The Golden Dawn trial has contributed and at the same time assembled shattering data on the role of Golden Dawn offices. They are not “simply” schools for Nazi education and recruitment, but for the launch of murderous attacks. Nazi theory combines and ends in a criminal act. For this reason, the closure of the Golden Dawn offices in every neighborhood must be the aim of all the sections of the movement, the Left and the democratic anti-fascist majority. This goal will not be realized by the bourgeois state, even with a conviction in the Golden Dawn trial. In fact, such a decision will “be served” and “executed” by the massive anti-fascist movement. That is why the “Initiative for the closure of the offices of Golden Dawn in Mesogion”, which started its action in Ambelokipi, and the decision for an anti-fascist march on 16 September 2017 towards it is a strategic choice that the whole anti-fascist movement will have to discuss and embrace. Against the debate about a “moderate Golden Dawn” or its “democratization”, we will need to emphasize the incurable Nazi (and therefore non-reformable) character of this organization. 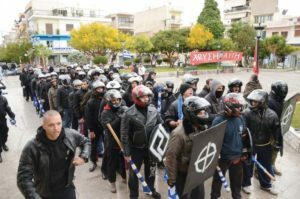 The murderous attack on 24-year-old student Alexis Lazaris on 31/3/2017 from the Security of the Golden Dawn headquarters in Mesogion, headed by Michaloliakos’s acolyte Christos Zervas, is a reminder that the Nazi organization may have largely suspended actions of the storm troops as long as the trial continues, but in no case has disbanded them. Four years after the assassination of Pavlos Fyssas, the fascist threat is real, but in no way invincible. It is a duty for the workers’ movement and the broad anti-fascist majority to crush it. Dimitris Psarra’s articles on Matthew Heimbach, which, in his statement, inspired the gathering in Charlottesville from Golden Dawn, whose executives he many times met in Greece: “A good friend of the Golden Dawn behind the carnage,” EfSyn, 8/2017 (online) and “Exporting Nazism to the USA by Golden Dawn”, EfSyn, 19/8/2017 (online). For an overview: Giorgos Pittas, Katerina Thoidou, Golden Dawn Folder: Neo-Nazi crimes and how to stop them, Marxist Bookshop, Athens 2013. XYZContagion, 9 + 1 scenes from the story of the Greek extreme right that shed light on the unknown Golden Dawn, Thessaloniki 2014, pp. 77-82. “The Political and Organizational Situation of Golden Dawn Today,” JailGoldenDawn, 6/1/2017. For more, see: Collective, Memorandum of the “Civil Prosecution of the Anti-fascist Movement” for the Golden Dawn trial, Marxist Bookshop, Athens 2015. Dimitris Psarras, “Golden Dawn exposes Mihaloliakos “, EfSyn, 8/7/2017 (online). Giorgos Pittas, “Shut down the offices of Golden Dawn”, Workers’ Solidarity, no. 1280, 28/6/2017.